Everything is coming up Rosie – My life from deep depression to happiness and harmony. My life from deep depression to happiness and harmony. Decisions – the cycle of doubt. With Ill health and constant pain taking it’s toll on me, I’ve been forced to rethink my life. I love where I live, however my home is a second floor flat, which is no longer practical. I made the decision to move to somwhere more suitable. Choice made – or so I thought. Apartment on the market, decision made, I told friends & neighbours. Bad move. From then has followed a concentrated effort to make me change my mind. It’s wonderful to be appreciated & told how much I’m needed & will be missed but it made a difficult decision even more challenging. Eventually the pressure got to me. I gave in. Second choice – stay where I belong. Estate Agency duly notified about my decision to withdraw my property from sale, I felt saddened yet relieved. New plans took shape. I couldn’t afford to buy a suitable property nearby so had to consider how life could be simplified whilst still here. With careful budgeting there would be ways to make things easier for myself. I’d need to give up my voluntary job & at least one of my groups but that would allow me time to rest and relax. Yes, good decision. But on the other hand……. An elderly friend bluntly told me how frustrating it was to see me procrastinating so much. She was right of course. Generally when I make a decision, I see it through, so why is it so different this time? Fear, pure and simple. Nor fear of moving but of making the wrong decision. Friends have been giving helpful advice about being careful, apparently due to my age, relocation could be risky. I might not make new friends. I may be lonely. I’d be throwing away a good social circle. Would it be wise? Doubts began to multiply. The infernal inner dialogue got me in such a muddle that I was no longer able to focus on the best solution. New friends continued to enter my life, my groups continued to flourish. Surely everyone was right? Leaving would be foolhardy……. Just as I felt brow-beaten into a forced decision, I realised that there is no perfect solution. I can stay, maintain friendships but live in an unsuitable environment, or I can take the risk and move away, alone but to a more disabled friendly location. Either way there will be gains & losses. So how do I decide? I chose to offer my dilemma up to the Universe & now await the answer. I set a date in which to remove my property from sale if no buyer appears and will trust that whichever way it goes will be right for me. It isn’t a cop-out, I could force the decision, keep reducing my price until I eventually sell, or can put my trust in the Universe & just wait to see what happens. The coming few weeks will be frustrating, not knowing if I’m leaving or staying but I’m no longer going to be running around like a headless chicken. If I sell, I move. If I don’t, I stay. Patience needs practice. I’ve lived here for almost 7 years & hopefully have another 20 years on this earth, so what difference will a few weeks make? I do realise, albeit painfully, that I must do what is right for me. Friends, if they’re genuine will want what’s best for me, not themselves. Of course I will hate saying goodbye, if that’s the way the dice rolls, but there will be new friends. As the saying goes : all strangers are simply friends not yet met. I love my friends, they are very special to me but maybe our journey together has come to an end and it’s time to bid them farewell. Deep down I believe I’ll soon be moving but won’t be too disappointed if no sale ensues. The thought of pastures new came in the wake of traumatic problems at the end of last year. Running away would have been easy. The constant indecision has forced me to take time out and rethink my reasons for relocating. I’m so thankful for that breathing space. Now, whatever happens, I’m ready to embrace my future. Trust is a wonderful gift. The importance of being popular. The heading of this post is intended as food for thought, not a factual statement. As children we strive for popularity, we are desperate to be well liked & be part of the ‘in’ crowd. For many of us it leads to feelings of inadequacy, as we fail miserably. We may well have friends, but for some reason we don’t quite match up to the ‘cool kids’. If we are lucky, we are accepted into the group, but are left trailing behind the popular leaders, never quite good enough to make the transition to becoming one of the central hub. For many this is the reality of growing up, some don’t even make it to the outer edge of the group, left alone & isolated, their childhood is marked with the overwhelming feeling of being a failure. The journey into adulthood passes through many differing stages, all marked with their own issues. Teenagers generally adopt a pack tendency, with everyone striving to find their place in the world, hence the individual & often bizarre fashion statements. This in between stage is all about attempting to find out who you are. Parenthood, especially the early stages can be extremely fulfilling, but can also turn into a comparison battle, with those annoyingly pushy parents who insist on flouting their childs’ genius or beauty. The majority of us, with our own cute, yet noisy, messy & let’s face it – normal children, are frequently left to question whether we’ve done our best for our offspring. Once again that familiar feeling of inadequacy. Later years, with battles for promotion at work & the cut throat fight to climb the ladder of success can, once again cause us to question our worth. Neighbours & friends seem to have more income, better homes, faster cars, fancier holidays & often, more harmonious lives. All in all, life can feel like fighting a losing battle. We accept that we’re never going to be one of the ‘special ‘ people, we are just Mr or Mrs ordinary, plodding through life, just tying to get by. Of course this is just a generalisation, there are those who sail through life, seemingly successful in all that they attempt, but they are definitely in the minority. This brings me to the subject for today – popularity. Throughout life we tend to go in & out of favour, but on the whole, the most confident ‘golden people’ will always be safely installed at the forefront of society, while the remainder spend a lot of time & heartache trying to reach those heady heights. Where on the popularity ladder are you? Let’s be honest, does it really matter? What makes a person popular? Sense of humour? Kindness? Appearance? Money? Maybe a bit of all of these, but these attributes are only skin deep. Someone who is central to a group could be considered popular, but move them to a different location, where they are forced to begin again, it is unlikely that they will establish themselves so easily. This would force them to begin on the lower rungs of the popularity ladder & attempt the hard climb upwards. The entire subject has no hard & fast rules, all we can do is try to find our way through the maze of life, hoping that we are accepted at some point. Following a recent conversation, it made me think about the importance of popularity. Within my own life I have flowed in & out of popularity, although it has to be said that I have mainly been an ‘also – ran’, a nice enough, friendly person, but never on the top of the invite list. In my present stage of life, I know a lot of people & am comparatively well known in the area. It could be said that I am popular because I am the ‘go to’ person, the one to call on when a volunteer is needed, but then again I have only a small selection of very close friends & am distinctly disliked by some members of society. So am I popular? No, probably not. So where do you draw the line? Is popularity about being liked by everybody? Celebrities are popular, yet apparently many of them suffer crippling depression & the happy, confident face is no more than a public mask. Robin Williams was a perfect example of this. He was much loved, always cheerful, you would imagine him to be fun to be around, yet his life was wracked with self loathing & feelings of inadequacy. He was certainly popular, yet so, so sad. So maybe that is the key – there is no real answer, it’s all subjective. I believe if we were all able to forget about striving to be popular & instead concentrated on learning to be the kind of person that we would look for in a good friend, the world would be a lot less stressful. None of us is perfect, to some extent we all wear a mask at times, attempting to cover up our characteristic blemishes. We all have aspects of ourselves that we aren’t proud of. We all sometimes say or do things that we regret. In other words – we are all human! If we stop worrying about what anyone else thinks & work at bringing out the best in ourselves, then the whole issue of popularity becomes unimportant. With a kind, genuine personality, friends will be drawn to you. Be spiritually generous, compassionate & caring, consider the feelings of others, while looking after your inner frailties, be honest & thoughtful. Smile often. Offer unconditional love to the world, yet treat yourself with respect & consideration. Be yourself, ensuring that the real you is a genuinely worthwhile person. If you achieve all of this, or at least make big inroads, you may not be number 1 on the popularity lists, but you will have something less fickle, you will be someone that many enjoy in their company. You will bring joy into other lives. That is worth so much more ! Thank you for taking the time to read my offering. Know that someone ‘out there’ is reading & hopefully enjoying my writing, makes it well worth the effort. Please consider ‘following’ me. Share this post with friends & family, press the ‘like’ button. All these things help us bloggers to keep going. Thankyou. What a tangled web can be created in search for our personal truth, Acceptance is much simpler although frequently lost on the youth. Why do I aim to be someone that I’m not? Just a creation in my mind? Being myself is all that I need – I’m compassionate and kind. For ourselves is all that we possess, all else is just on loan. Our fates are with the Universe, this earth is just our home. By gratefully accepting our given role in life Will put an end to misery, discontentment, sadness, strife. I now understand my path in life, who I was meant to be. The only role that I need play, is the one of being me. So I’ll strive no longer, search no more for truth to become clear, It’s always been here, always will. I have the life that I hold dear. I believe that generally people worry too much about poetic correctness. Don’t! Sometimes writing something simple in rhyme helps make sense when the mind is a whirl of confusion. Simplicity. That’s the key to so many wonderful things. Thank you for taking time to look at ‘Everything is coming up Rosie’. If you enjoyed it, please consider following me, also a ‘like’ & ‘share’ would be most welcome. Like all struggling writers, knowing that someone is reading my words makes everything worthwhile. 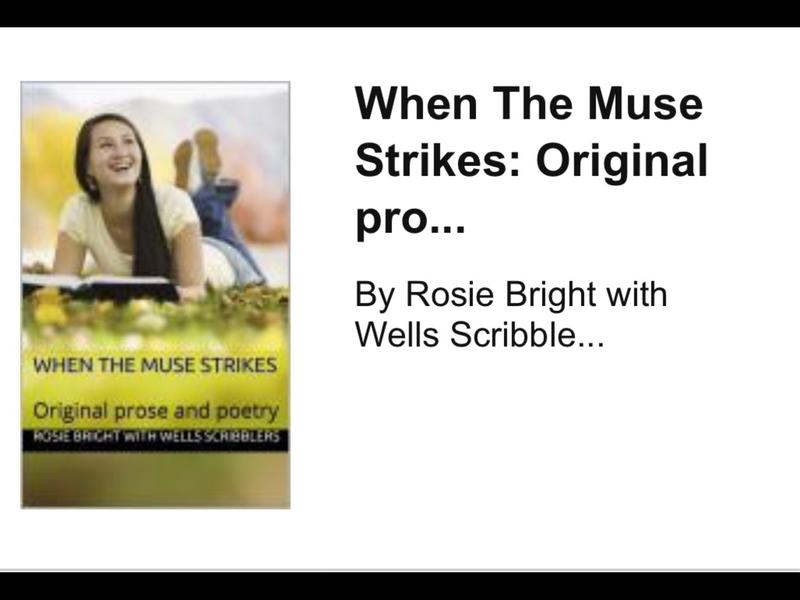 You can find an anthology of work from my writing group on Amazon, under the name ‘When the Muse Strikes.’ By Rosie Bright & Wells Scribbling Scribes. Price £2.49 All proceeds to charity. I have published a children’s book, also on Amazon, called ‘Silly Tilly gets Lost.’ Aimed at 3-6 year olds. Find it under Rosie Bright. Like many people of the older generation, we were brought up to believe that once you exceed your ‘best before’ date, new knowledge isn’t something to worry about. Our poor old shrivelled brains don’t need to be bothered with such things. Agreed, information isn’t absorbed as readily as in youth, however learning anything can be invogourating, can help to keep life interesting, as well as helping to stave off the ravages of some forms of dementia. Since I reached my 60s, my thirst for knowledge has actually grown, even though I am unable to process/ retain some information due to stroke damage.However, by accepting certain limitations and changing direction in my quest, learning less academic subjects, instead favouring those that have more relevance in my life, has been a real brain stretcher. As someone who left school, aged 15 without qualifications, I always intended to attend adult education classes to gain at least the most basics certificates. With all good intentions, a large family & manic home life got in the way and when I was finally able to spare the time, my confidence had deserted me. I told myself that I was obviously stupid & would probably never have passed my exams anyway, besides, how relevant would it be now anyway? I can see now that I was just making excuses to cover up my fear. Almost five years ago my life changed dramatically when I found myself single again. With a unused brain & disabling depression, I felt like the village idiot. Try as I might, I was unable to retain anything. Yes, I obviously was thick! But no, I wasn’t! I simply had limited my learning abilities as a form of self protection. If I didn’t stretch myself, I couldn’t fail, could I? Once I had fought my way out of the depression, I knew that I needed to find something to keep me stimulated, to prevent the likelihood of a recurrence. And so my love of learning began…. It started on a very small scale, dabbling with pottery and art, with a lot of home reading. I became obsessed with holistic healing ( something I’d always even interested in.) Shortly before my divorce I’d surprised myself by training as a Reiki therapist, even as far as becoming a Reiki Master, although I wasn’t really convinced of my worth. Once single, I began to relearn & gradually added to my list of holistic abilities, even so, confidence was by far the biggest challenge, but no books could really teach it, I had to discover it for myself. Once I had found confidence, nothing seemed an impossibility, I realised that actually I could attempt anything that I wanted. Suddenly succeeding seemed less important than having a go. With a lot of encouragement I became a flexercise leader ( I thought it was an easy option), but soon I realised that I didn’t want to stop there. Certain things were unrealistic due to health restrictions but I have since accrued a list of practical qualifications. Through my voluntary work I have taken training in Mental Health studies, taken courses in Life Coaching, first aid, food hygeine & safety. I am newly qualified as a Tai Chi Instructor, Food Waste Champion, run a writing group and lead a women’s group, with another one starting next month. I have written books, learnt to self – publish, have become a motivational speaker & next week have to go before a ‘dragons den’ type panel, to try to obtain a grant to further my work. I can now set up basic websites, write a column in the local newspaper, have several voluntary positions & am currently undertaking three different online college courses. Phew! I’m exhausted just reading that list. It’s as if it has happened to someone else, not me. Not stupid, unqualified me? Me who was only capable of making good cakes & looking after children? Me, who thought that I was a write off! I still don’t have academic qualifications, I am currently taking an English Grammer course, simply because I believe it will aid me with my writing, but as for the rest? Well, I have realised that I’d rather use my brain space with things that interest me. I don’t need a certificate to prove my worth. My life is doing that! I know that not every pensioner shuts down their brain, some are naturally interested in continuing achievements, however far too many aren’t. I’m not advocating that everyone follow my path. There is no one right way. Everyones’ journey is different. However I wanted to share this with you all, to prove that nothing is impossible. If I can encourage one person to achieve something that they can feel proud of, then I will be delighted. Life is very different for upcoming generations, where women in particular are becoming more self – assured & are able to follow their ambitions a lot more easily. Pre 1960s,Women were only good as housekeepers, wives & mothers, maybe reaching the exalted heady heights of shop assistant once their children had left home. Thankfully that is in the past, most people in developed countries have choices now. We are very fortunate to live in a Country where we have freedom of choice (more or less) we don’t have to scrabble for food & on the whole our lives are fairly comfortable. However it breaks my heart to see so many older people who are resigned to a life of loneliness & misery because they feel unworthy of anything more. Their latter years are filled with little more than a television for company. They don’t believe that they are capable of anything else. Three words : YES YOU ARE! Two words : GO FOR IT! I hope that you enjoyed reading this, please feel free to let me know. Please ‘follow’, ‘share’ or ‘like’, it will be greatly appreciated. I really value those who read my ramblings. Thank you. Putting my patience to the test. I have just added my first two books onto Amazon ( kindle, Kobo inc) which has been hardwork & more than a Little perplexing. Not only did I have to learn the whole e-publishing thing, I had no idea how to format my manuscript correctly. A couple of weeks ago I published my first book; Silly Tilly gets lost, but once it was online I discovered that I had made mistakes. I re- edited & republished, only to find that I’d done it incorrectly. At the same time I was desperately attempting to complete and publish a book for charity, a compilation from my creative writing group. After an initial hiccup I figured out the system, but every time I thought it was ready, I’d republish, only to discover further errors. It took 18 edits in all, which must be something of a record. However it, like the Silly Tilly is now live on Kindle. Naturally I’m delighted but I have to admit to nearly giving up. I’m sure that the errors were mating! They seemed to be multiplying! I wanted to throw in the towel so many times! In my past I would have either given up, or made it passable & just accept it as ‘good enough.’ There may well still be unfounded mistakes, it was my first time, s perfection was probably unlikely, however I believe it now to be As near perfect as possible. This has been a hard but useful learning curve. I could have given up, or just made do, but wouldn’t have been satisfied. Perseverance was necessary. Anything worthwhile is worthy of it. I will remember this lesson, I will also give thanks for the new skills that I have learnt. 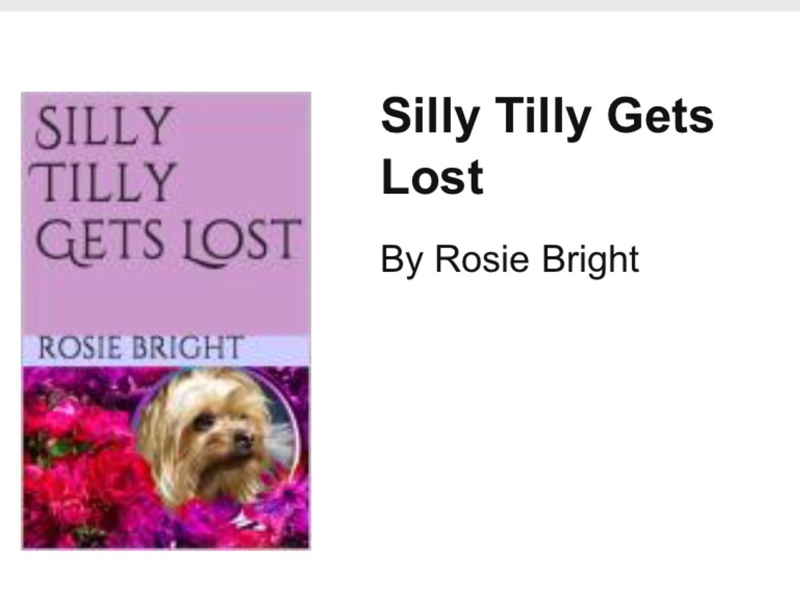 Time to continue with book Three…..
‘Silly Tilly gets Lost,’ by Rosie Bright. Price £2.99 available on the kindle/ Amazon site. This is a story about a cute, yet naughty Yorkshire terrier. It is the first in a proposed series & is aimed at aged 3 – 6 year olds. The second book is a compilation book,from members of my writing group, with proceeds going to charity. It is filled with mainly humorous/ light hearted short stories & poetry, also included are many 50 word and 6 word stories. It is called ‘When the Muse Strikes by Rosie Thomas with Wells Scribblers. Again priced £2.99 available on Kindle/ Amazon. I hope that you will consider buying one or both. Your support will be much appreciated. If you enjoyed my blog, please consider following me, to be notified of further posts. Clicking on ‘like’ or ‘share’ would also be very welcome. New bloggers and authors need all the support they can get!